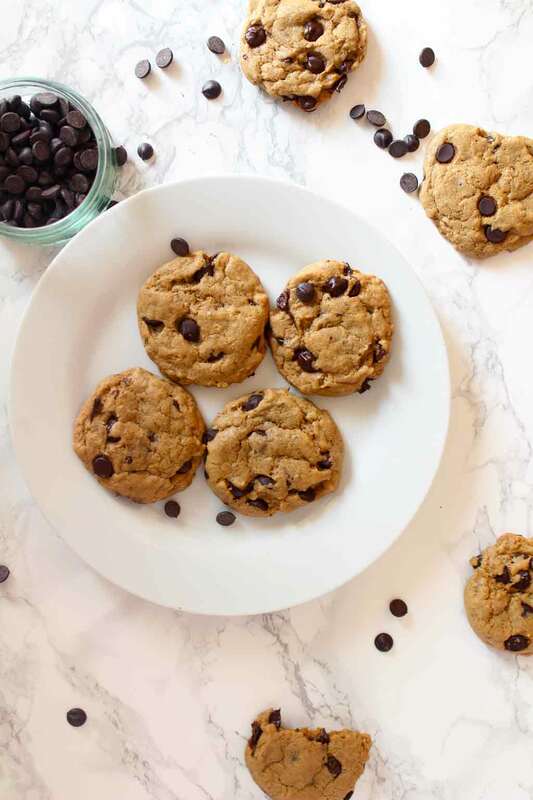 These vegan chocolate chip cookies will melt in your mouth. They have brown and slightly crispy edges, a soft, gooey centre and a crinkly top. 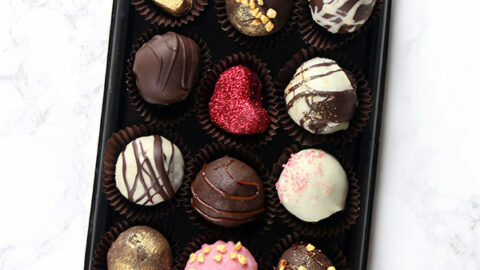 And of course, they are jam-packed with delicious bites of chocolate. 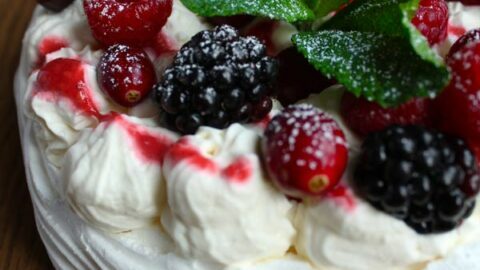 My site was lacking a lot of “classic” baking recipes. 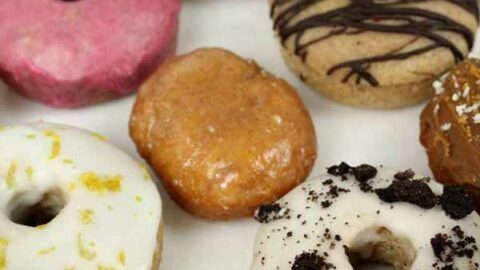 When I first launched Baked By Clo, I was so focused on experimenting and creating something “new” that I forgot the desserts that everyone loves the most! You just can’t beat the classics. 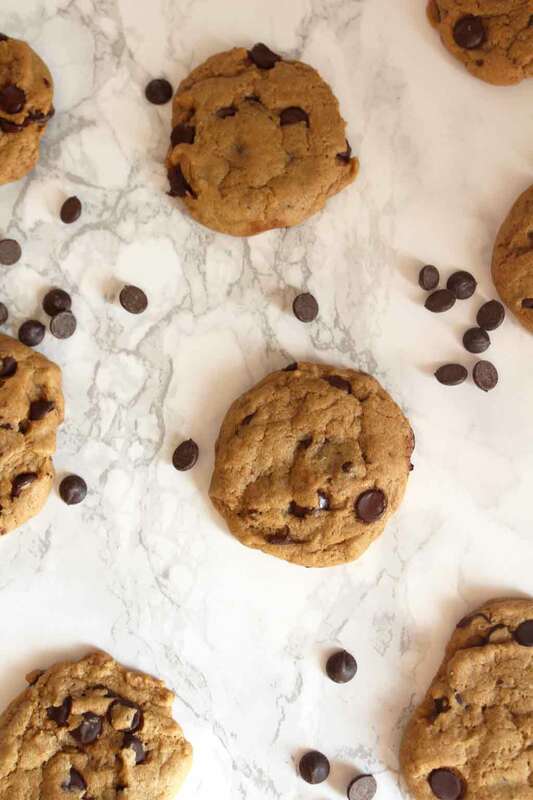 The latest addition to this list is these vegan chocolate chip cookies. I don’t know about you but I LOVE the kind of cookies that are soft and chewy. You know, the kind that you can buy fresh from the bakeries? Don’t get me wrong, I’ll take a crunchy cookie with a cup of tea any day. But when it comes to chewy cookies, something about them just makes me lose all willpower and self-control. One cookie always becomes 2, 3… then all of a sudden there are none left. 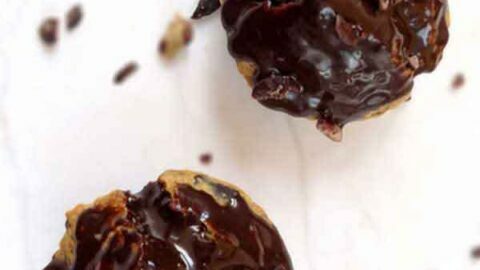 If you like your cookies a little crunchier, that’s no problem. 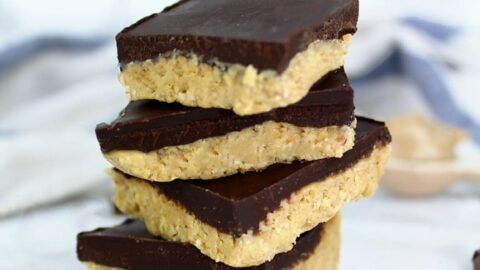 You can still make this recipe- all you need to do is bake them for a little longer. The reason I love these cookies so much (aside from the way they taste) is that they create very little mess. You can do it all using two or three bowls and it makes for super easy clean up. They’re also very simple to make. Making the dough requires just 8 ingredients. The only thing that’s a little time-consuming is waiting for the dough to chill. But I promise you, it’s worth it! 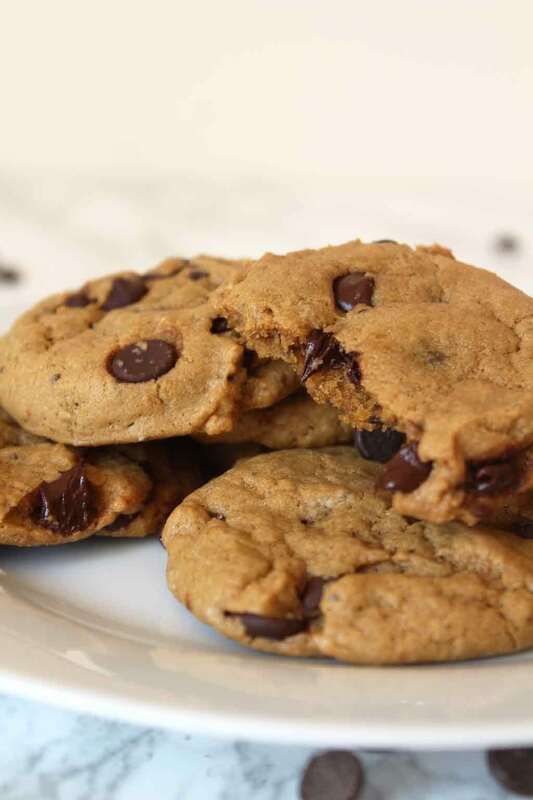 How Do You Make Chocolate Chip Cookies Vegan? When I first went vegan, I had a massive craving for cookies. Pretty much all day every day. But at that time, there wasn’t really anything like that readily available in the supermarkets. Actually, I don’t even think there is these days either but correct me if I’m wrong. Not being able to go to my local Tesco and pick up a pack of chocolate chip cookies meant I had to learn how to make them from scratch. I’d made tonnes of cookies prior, but this was my first time attempting making any kind of vegan dessert. How the heck do you make cookies without eggs or butter? Surely, without eggs, the cookies would just fall flat and end up being crispy discs? And butter!? Isn’t that the most crucial ingredient for making chewy chocolate chip cookies? Turns out, I needn’t have worried. It is actually SO simple. 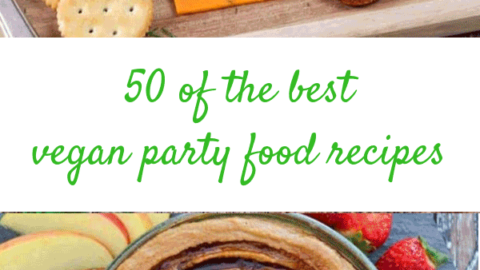 A quick Google search will give you all of the vegan baking replacements you could ever need. Eggs? 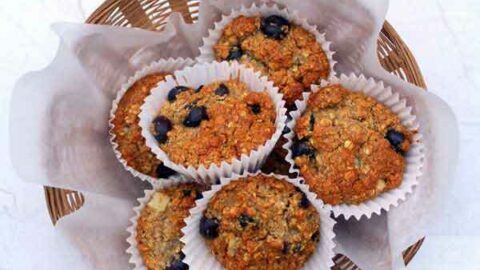 Switch those for ground flaxseeds, chia seeds, applesauce… the list is endless. And there are actually plenty of vegan butter replacements for baking. The vegan spreads are available in the supermarkets, right by the dairy butter. 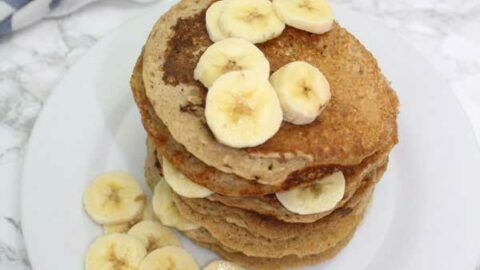 For this recipe, I used ground flaxseeds mixed with water instead of eggs. And I used vegan butter instead of dairy butter. Everything else in my chocolate chip cookie recipe was already naturally vegan. First off, you’ll need to make your flax egg. You can do this by mixing ½ a tablespoon of ground flax seeds with 1 tablespoon of water. Leave it to sit for a few minutes to allow it to gelatinise. I experimented with a few different vegan egg replacements for this recipe but found the others interfered too much with the flavour or texture. Flax eggs came out on top this time! Next, you’ll need to melt your vegan butter. I do this by popping it in the microwave for around 30 seconds, then leaving it to cool for a minute or so. Pour the melted butter into a medium sized bowl. Next, add in your sugars. 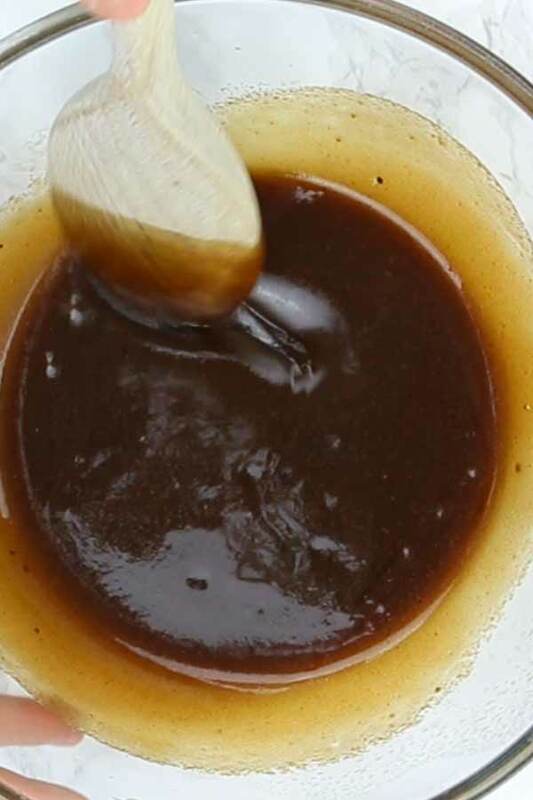 For this recipe, I used a mix of brown sugar and caster white (super fine) sugar. Using a higher amount of brown sugar in comparison to white helps give that chewy aspect that I looooove so much in cookies. Add the “flax egg” from earlier into your bowl, along with some vanilla, and give everything a good mix. You should end up with a watery mixture at this point. Now it’s time to add your plain flour and baking powder into the bowl. Add in your vegan chocolate chips or chunks (I used Asda’s dark chocolate chips). Stir them in until they are combined into your mixture. At this point, the mixture may not look like it will come together as a dough. But if you use your hands to combine it, it should make a very wet and sticky dough. Wrap the sticky dough in cling film/ plastic wrap and let it chill. Chilling the dough before baking allows the butter to firm up a little, preventing the cookies from completely spreading and flattening as they bake. Because I’m impatient and want my cookies to be ready ASAP, I like to put it in the freezer for quickness. 30 minutes will do the trick. Once you’ve chilled the dough, it should be firm and easy to handle. 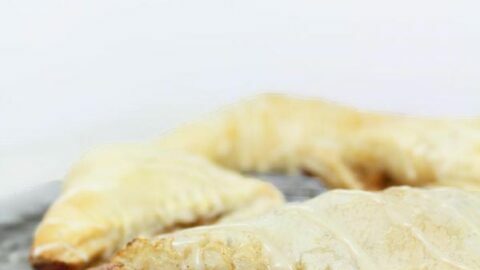 Take one tablespoon of dough at a time and place it onto a baking tray lined with parchment paper. Use your fingers to slightly flatten the balls of dough, but don’t squash them completely. 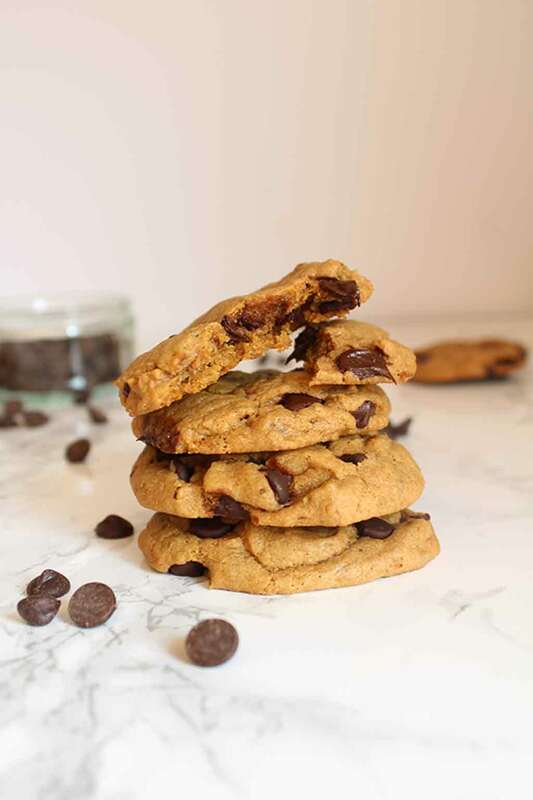 This recipe will give you 10 vegan chocolate chip cookies but feel free to double or half the recipe as required! Bake the cookies at 180C/ 350F for around 12 minutes. They will still be soft at this stage and may even look under baked. But leave them on the tray until they’re completely cool and they’ll magically firm up. The result? 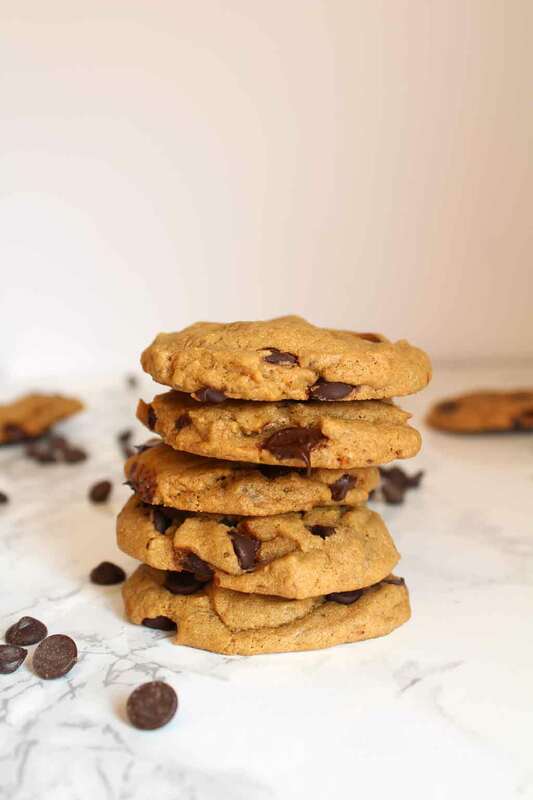 Deliciously soft and chewy vegan chocolate chip cookies. Chill the dough before baking. This helps to bring out the flavours more and prevents the cookies from spreading too much. It also gives the flour a good chance to absorb excess moisture to prevent the cookies from falling flat. 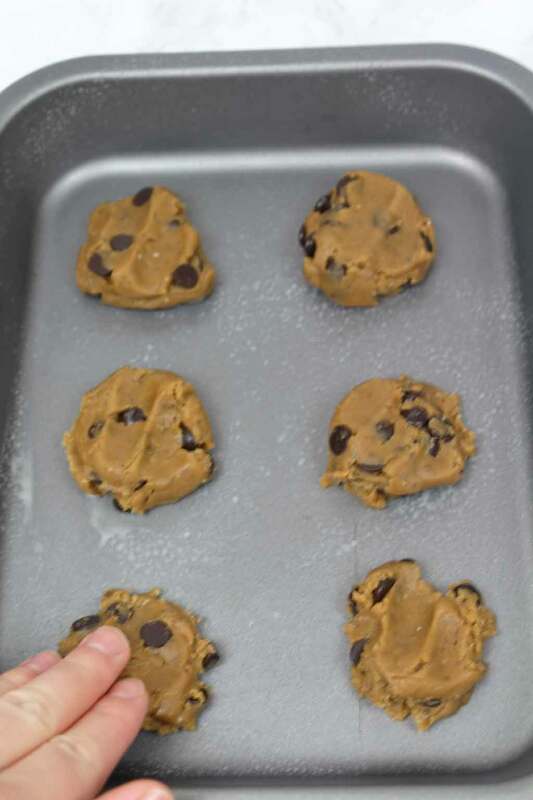 Use a tablespoon or small scoop to divide your dough, to ensure the cookies are all the same size. Bake in small batches (i.e. 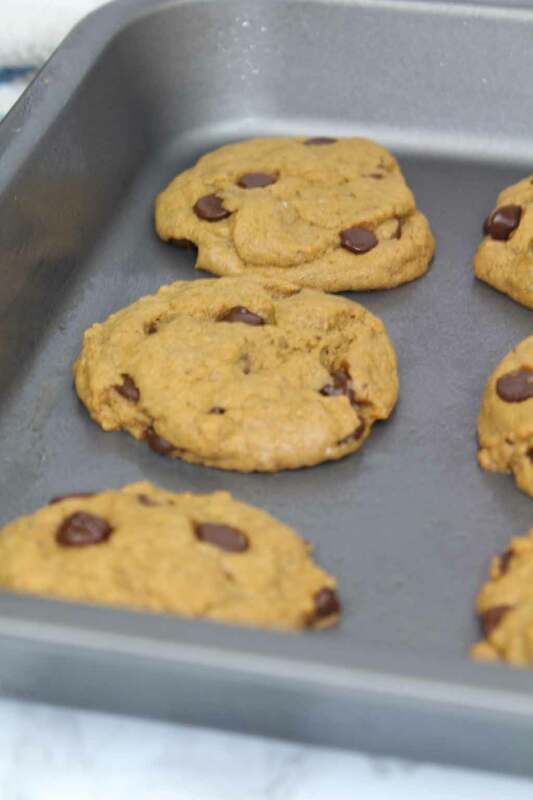 don’t overcrowd the baking tray) to allow your cookies to bake without sticking together. Bake the cookies for 3-4 minutes longer if you prefer a crunchy texture. Allow the cookies to cool completely before attempting to remove them from the tray. Experiment with different add-ins. Some of my favourites are vegan white chocolate chunks and chopped almonds. 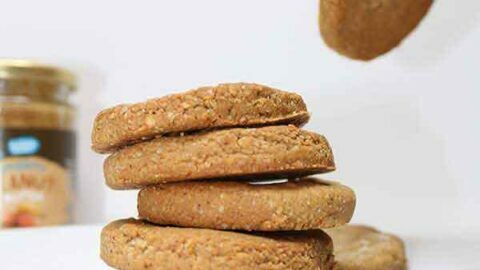 These cookies are best stored in an airtight container and in a cool, dry place such as a cupboard. Another good tip is to make sure there’s parchment paper underneath the cookies too. This helps prevent them from drying out so fast. Can You Freeze Chocolate Chip Cookie Dough? Absolutely! Freezing the dough can be so handy for those days that you don’t have a lot of time to bake, but need freshly baked cookies for whatever reason. If you want to save your cookie dough for a later date, just follow steps 1 through 7. You can keep it in the freezer for up to 2 months. Before you go on to divide and bake the cookie dough, allow it to slightly thaw first for around 20 minutes. I hope you enjoy these cookies! If you make them yourself, please let me know how it went by leaving a rating below. 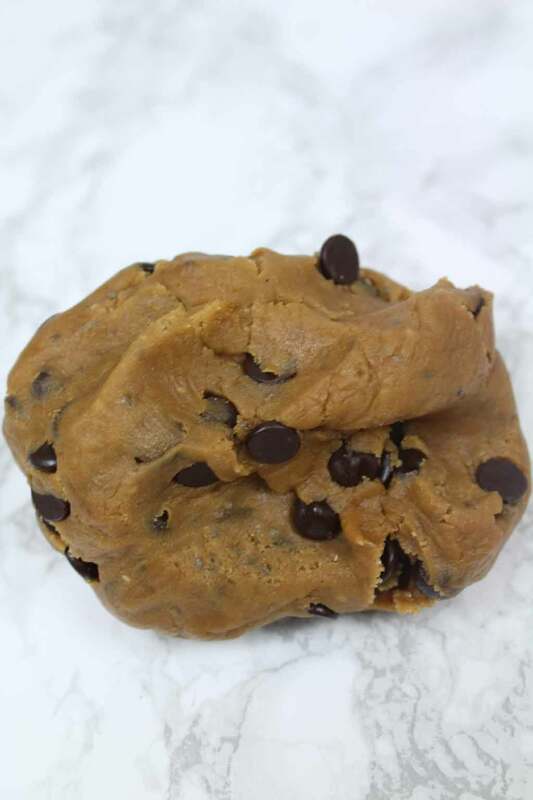 A vegan twist on the classic chocolate chip cookie. In a small bowl, mix the flax seeds with 1 tablespoon of water and set aside for a few minutes. Add the melted butter to a medium-sized bowl along with the brown sugar, caster sugar, and vanilla. Mix well. Add the flour and baking powder. Mix until combined, then stir in the chocolate chips. You should have a super wet, sticky dough. Wrap the dough in plastic wrap and freeze it for 30 minutes. In the meantime, preheat your oven to 180C/ 350F and line a baking tray with parchment paper. Remove the dough from the plastic wrap and use a tablespoon to divide it into equal size balls. Place the balls onto your baking tray and slightly flatten them using your fingers. Be careful not to squash them completely. Bake the cookies for 12 minutes and allow them to cool completely on the tray before removing. *Bake for 15 minutes if you like a crunchier cookie.